I have pulled a muscle. Not so much pulled as stretched the living fibres out of it. It’s somewhere along my shoulder or my neck and also the back of my head. And it’s really not surprising because as has frequently been mentioned on this page, Baby N is not a lightweight. Or as J likes to say to Baby N when we get to the “Babies come in all shapes and sizes” page of Baby N’s favourite book about babies, “You’re an extra large!”. My body has put up a valiant effort, but I think it’s starting to fold under the strain. So today I bought some relief. I went for a massage. I haven’t had massage since I was pregnant with Baby N. My obstetrician recommended I go to help with the constant migraines I get when pregnant. Massage on doctor’s orders. G-d bless my obstetrician. Massage didn’t help the migraines at all, but it was bloody fabulous. I have tried a few other pain relief methods already for this neck issue. Panadol does not work. Nurofen brings short-lived, minimal relief. 3 glasses of red wine, I discovered last night at our friends’ housewarming, is remarkably effective. However this is not a good day time solution, what with school drop offs and the like; sobriety is somewhat important in my line of (unpaid) work. 4 bottles 2013 Autumn Harvest white, 2 bottles 2012 Rose, 2 bottles 2012 Reserve Verdelho, 4 bottles 2012 Soft Red. You need to use the K4KK promo code, and you can make your own mixed dozen. Price includes delivery. value. This time I may need to buy two boxes: one actually for Rosh Hashana and one for medicinal purposes. I really should get a Medicare rebate. Anyway back to the massage. The lady had the strongest fingers of anyone I have ever met. Possibly she had just been through a bad break up, and had mistaken my body for her boyfriend. She poked, pressed and pummelled. No knot was to be left knotted. She zeroed in on that spot where my neck joins my head and I thought I may pass out. I have not breathed so deeply since I was in labour. For 30 minutes I varied between “oh….sore……but good sore” and “I’m going to die”. But when I got up off that table after half an hour, I felt nothing. Complete blissful absence of twinges or pains. My bum has never felt so relaxed. Turns out I was squeezing those cheeks for dear life as my jilted masseuse toyed with my pain threshold in her unconscionably strong hands. somewhat odd when I said “I’m going for a massage and then I’m going to try on a dress”. He started laughing, “You mean you want to buy a dress”. “No”, I explained, I just want to try one on”. Off to Zimmerman I went to try on the dress I had seen hanging there, beckoning me with its luscious pleats and tucks, every time I power walked past, Baby N in pram. I went in and asked for my size. She only had it in plain black, and I wanted the floral. She told me try it on and if it fit she would try and track one down for me. So into the change room I went and tried on the dress. It was gorgeous. Really stunning. Classic. An investment really. I mentally filed it on my “buy when on sale” list, and started planning a spring/summer Pinterest board. The sales assistant came back. She suggested I try the next size down in the black and she would see if there were any florals available in that size. The smaller size looked even better. The sales assistant returned once more to tell me that there were three left in the country, and she would phone around to see if she could get her hands on one for me. Working Boy may be more inciteful than I first credited him for. Now I really wanted the bloody dress. Nothing like knowing the rest of the country is hounding down your dress to turn it from a “just trying on” to a total outright must have. So that’s it really. I bought a massage. I want to buy some wine. I really, REALLY want to buy that dress, and……I bought some more nurofen. 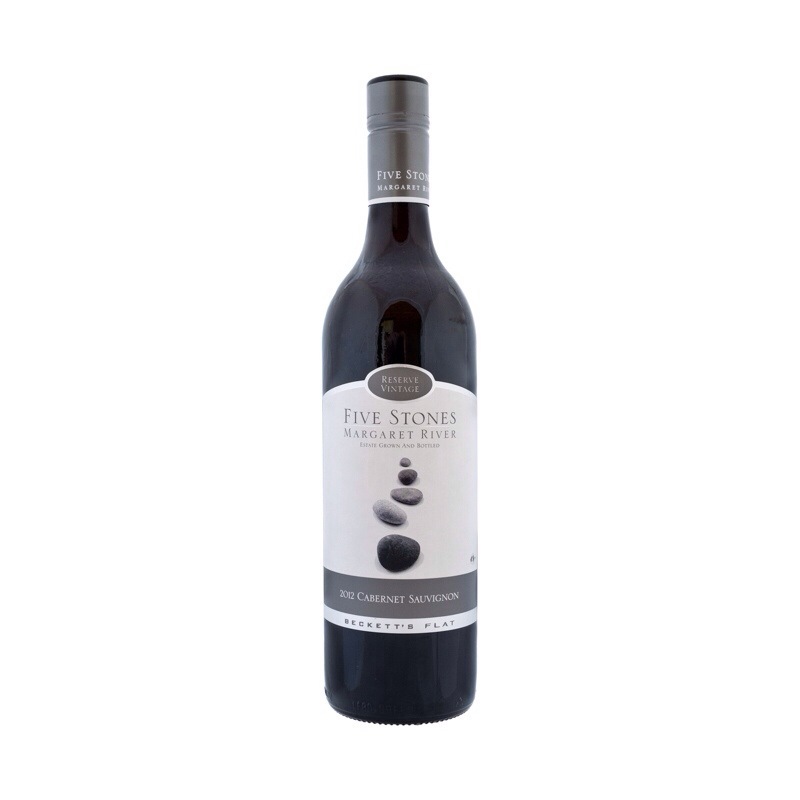 My pain returned within a couple of hours and the wine takes a few days to ship. Shopping is a language and you either speak it or you don’t. I speak fluent shop. It’s one of my many talents. Recently, Working Boy took the kids to an indoor trampoline park. I had planned to take them myself but of course Baby N managed to change his nap schedule as a one-off special and he ended up having just fallen asleep when we needed to leave for our booking. Luckily Working Boy had taken the day off and happily obliged in taking the kids. Not so luckily, 1 hour after their departure, he rang me to say he had been called in to an emergency, and he had to leave. I woke up baby N and jumped in the car. I have never been to the trampoline park before. I didn’t know exactly where it was. I called a friend, who gave me the street directions, which I mostly got, but was slightly unsure, especially the part about turning across traffic into a small side street off a busy road, before you actually got there. As soon as I got there (once I had done an illegal U-turn after missing anonymous side street) it was obvious. Skyzone is across the road from Space Furniture and Domayne, just behind Nick Scali and Cosh Furniture. If my friend had said that, I would have known exactly where to go. Because that is my language. Note to Skyzone – I would put my description under “address” on your website rather than 75 O’Riordon St. When we bought our car three years ago, they wanted to know what colour we wanted. It’s often hard to tell from their colour chart how it’s going to look as a car, rather than a small square on a piece of glossy paper. We were told we could go and visit a different dealership to see our car in our colour. If our salesman could have just said “You’re considering the charcoal? 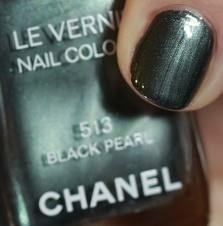 Think Chanel Black Pearl” we could have saved the shlep time. To speak shop, you have to think shop. And that I do. I have an imprint of Westfield Bondi Junction behind my retinas. And it must show, because random people constantly come up to me and ask me if I know where a certain shop is. It’s eerie. Luckily for them, I always do. I never lose my car in the car park. And yet I have been known to lose all sorts of things in my house. Maybe if I set up little shop fronts throughout my home, I won’t lose things as often. Or aisles even. I know my Coles aisles by heart too. Who knows? Perhaps this is genetic and my kids will stop losing their things too. “Mum have you seen my school bag? ?” “It’s in aisle 2, sweetheart. Across the road from “Mess is us” where all your stationary is, and a few odd sheets of homework, two random pieces of Lego and a key to unknown lock”. I am not intrinsically a tidy person but I’m trying. I think this could be the key. It’s raining, again. Last week it rained for a few days straight. We are spoiled here in Sydney….brought up on a diet of fresh air and sunshine. After day two of incessant rainfall, I had to get out of the house. Baby N tires of 10 years of collected toys in 10 minutes. I did not have anything pressing beyond the usual housework / cooking / kids to do. So I decided to go to the Supa Centa (yes that is how it is spelled. It’s a bugger to find in the Whitepages if you don’t know this). The Supa Centa, as its name does not suggest, is a mall comprised of homeware shops. As we are still furnishing our house it was time not wasted, and it provided long stretches of undercover ground to wheel Baby N, with interesting windows for me to look at. 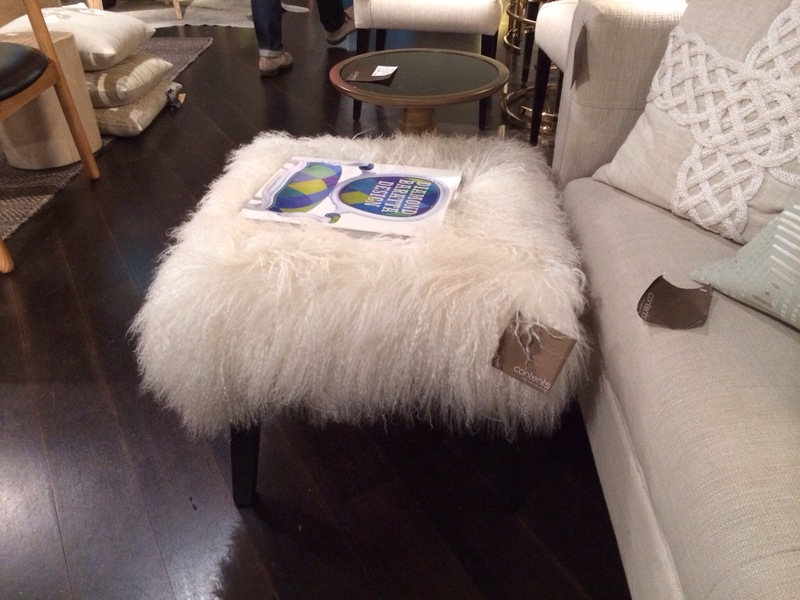 It is also home to fluffy foot stool, which I am patiently waiting to go on sale. If you could see my wardrobe you could see why FFS is a perfect fit. 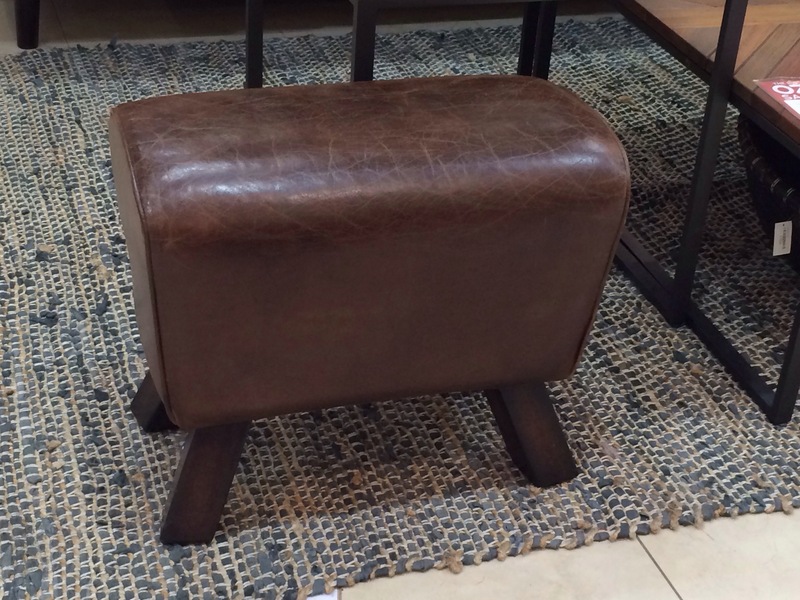 Sadly FFS (hereby known as FO-fluffy ottoman- because FFS stands for something else too…..oh wait……okay FFS/FO will henceforth be known as TFS – The Foot Stool) was not on sale, so I admired her woolly glamour and kept charging along the mall. I want a day bed or chaise for our bedroom. Working Boy has his own study – that will be my office. I will sit, coffee and iPad in hand, and do all my writing and business. Office furniture is a tax deduction, no? There was an exhibition through the middle of the mall, called Workshopped. This made me feel cultured, and instantly turned me into the sort of person who goes to cool design events that no-one’s heard of. Go me. 3. In the window of Top3. I really, REALLY love that lamp. The recent proliferation of logs, mushrooms, owls, deer and the like has revealed that I am somewhat of a woodland fan. I know, I didn’t have myself pegged as a woodland kind of girl either. 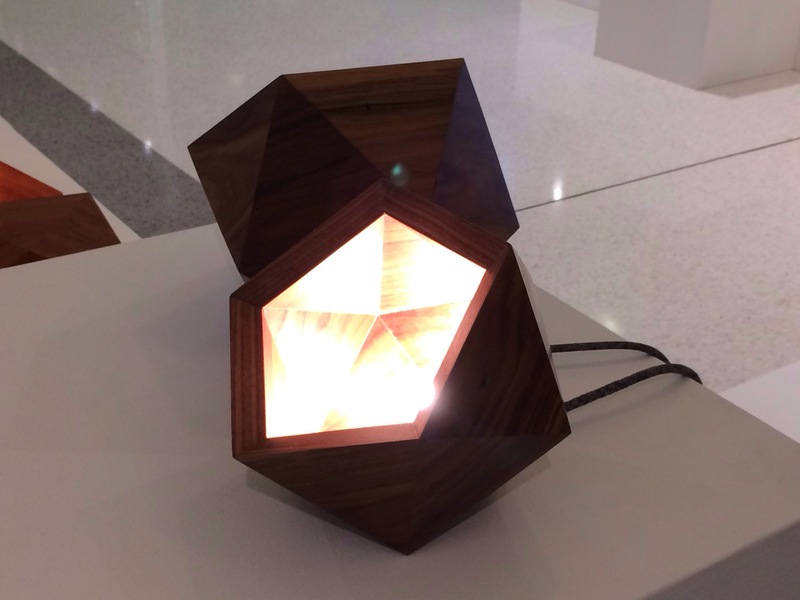 Anyway that lamp is perfection. 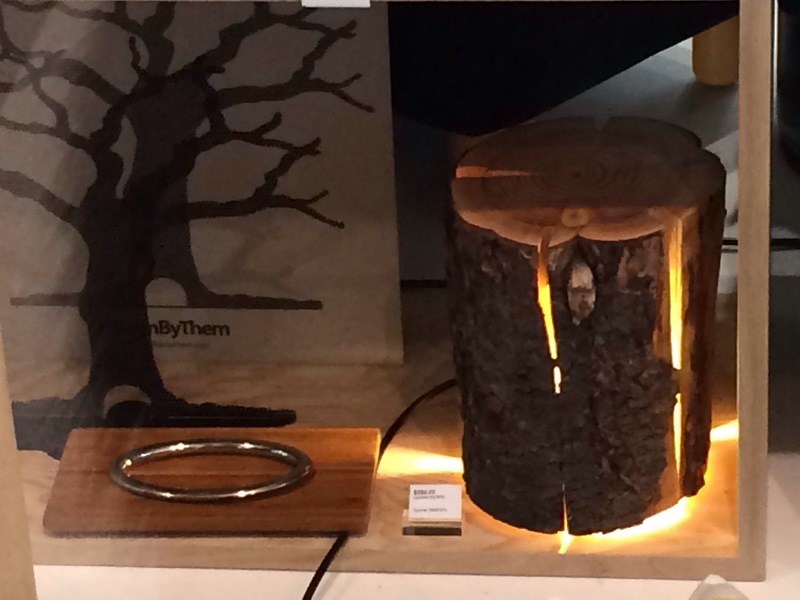 I’m just not sure it goes with the house…..although Baby N could do with a log lamp surely? 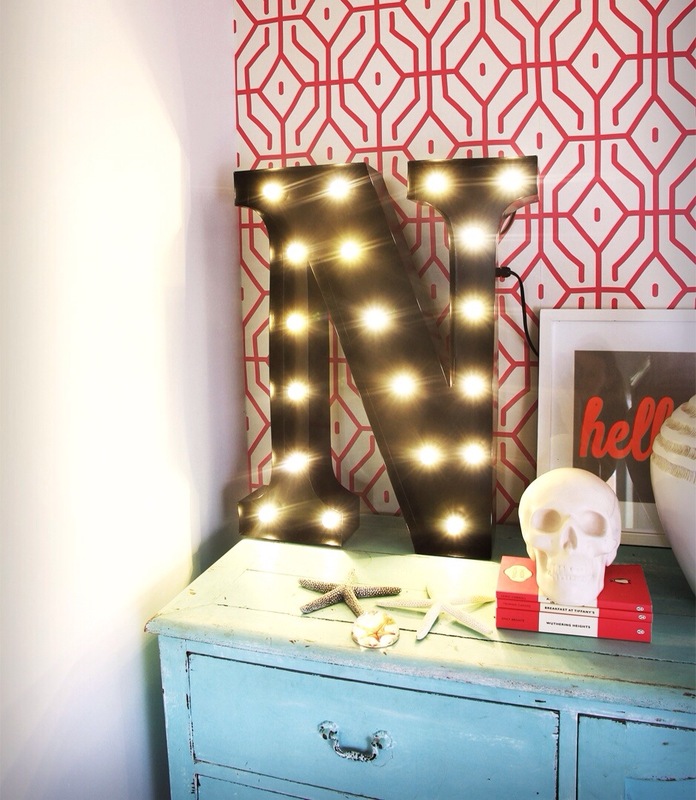 (Decorator rule 1: when in doubt, put in the baby’s room). Would someone please buy this coffee table??! I love it. Concrete and wood. 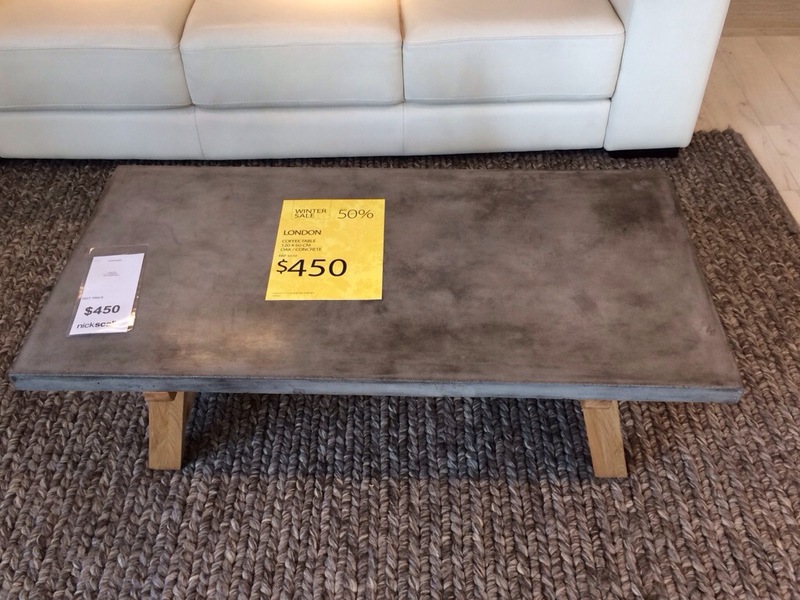 And cheap (for a coffee table). 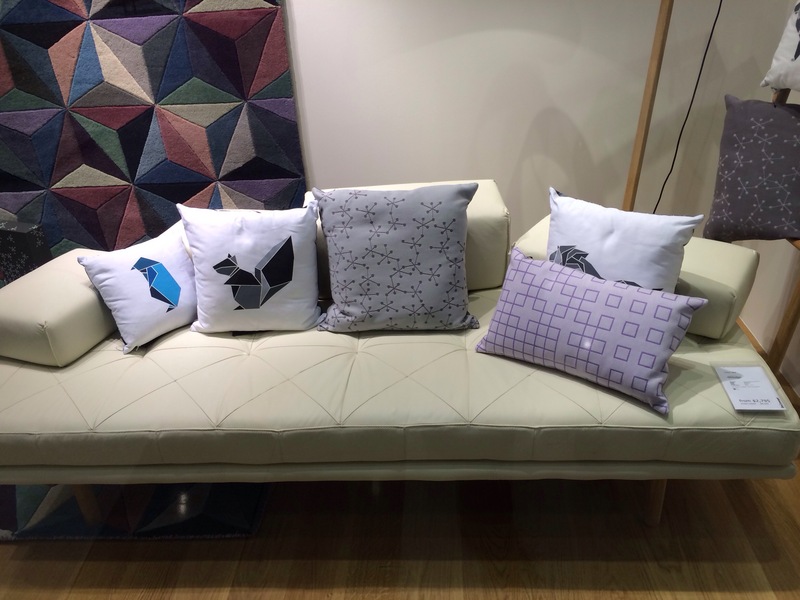 Unfortunately we need a larger one, and one that is NOT the same colour as our sofas) but I wish I could buy this one. I love a bit of industrialisation. This is also perfection. Table perfection, not lamp perfection this time. Just the right amount of industrial, polished, simple, unscratchable. 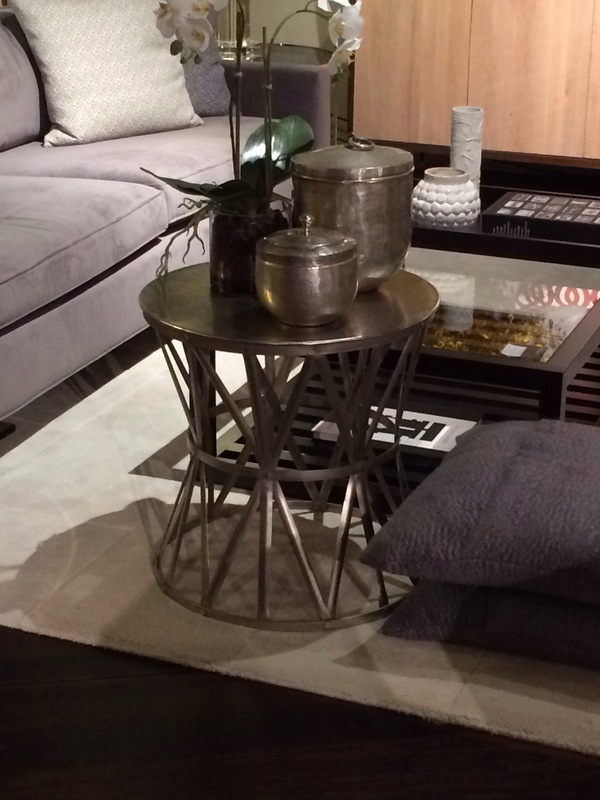 As difficult as it is to find a large coffee table for our lounge room, it is ridiculously easy to find a great, round side table. They are everywhere. I saw at least 3 during my walk. I’ll have one for next to my one-day chaise but in the meantime I’m looking for one for the living room. The problem is they are ridiculously easy to find. How do I begin to choose? 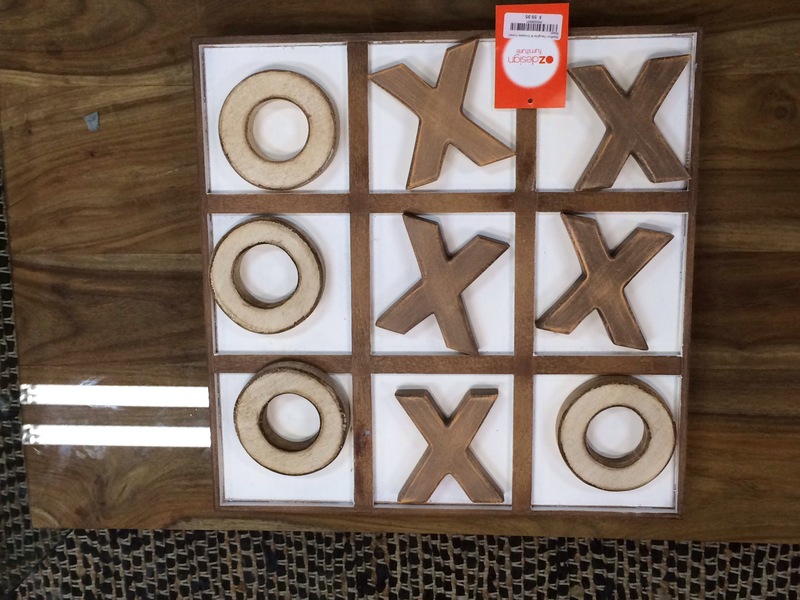 I like the idea of this on our (yet to be purchased) coffee table. However, and it’s a big however, at the moment I spend a not insignificant amount of time picking up my magazine off the floor and replacing them on our existing coffee and side tables. Baby N : 53, Magazines & Shopping Girl: 0. Baby N has a “thing” against things on tables it seems. He’s broken my lolly bowl. He pulls down and destroys every magazine. 3 out of 4 of my Kate Spade glitter coasters are missing. I don’t fancy adding “hunt for 1 nought and 2 crosses” to my never ending to-do list. 7. 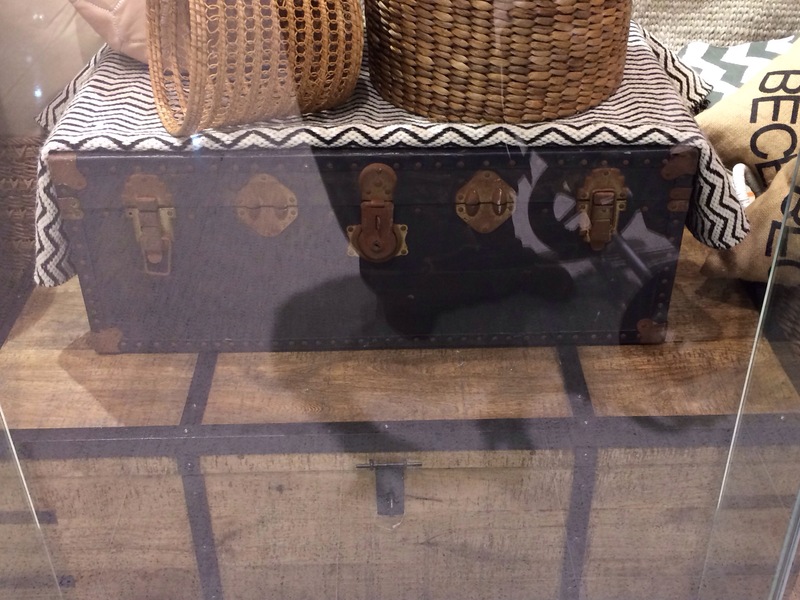 Trunks in window of unremarkable shop…..
out to give the shabby to your chic. After the trunks, things got a little strange. I think our display shelf needs some random pieces. 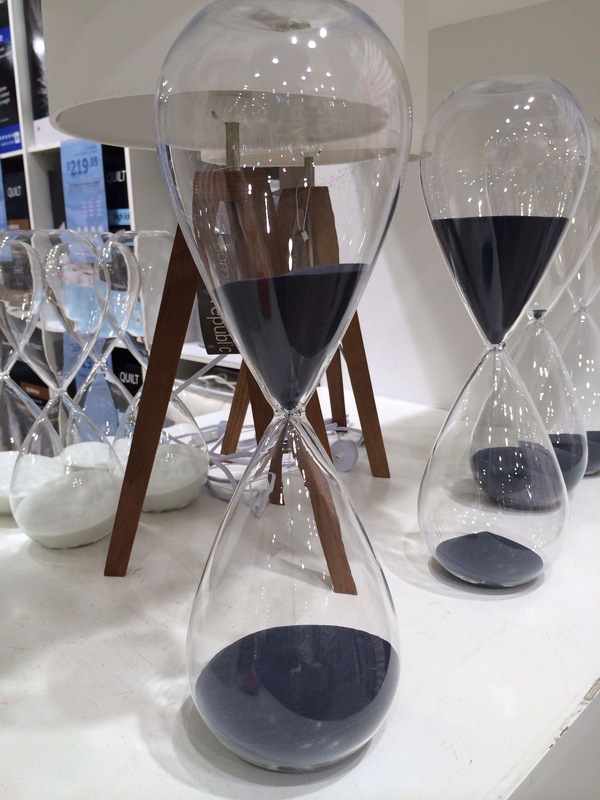 And what better for a random piece than a giant hourglass? The problem is that I think watching time slipping away will make me feel stressed. I already watch time disappear before my eyes (and also items on coffee tables) trying to get four children dressed, fed and out the door. Also Baby N. I see shattered glass and sand everywhere in my future. Which makes me think actually a crystal ball would look amazing on the shelf. Adairs? Got any crystal balls? As far as I can tell these are mass produced shoe blocks. I just can’t even begin here. Shoe blocks? On display? Are people going to think I am an artisan shoe maker? No they are not. And if not, I cannot work out what message the shoe blocks are supposed to send. I would sooner put an actual pair of shoes on display (and trust me, if I can get it past Working Boy I actually will). Shoes can be art. 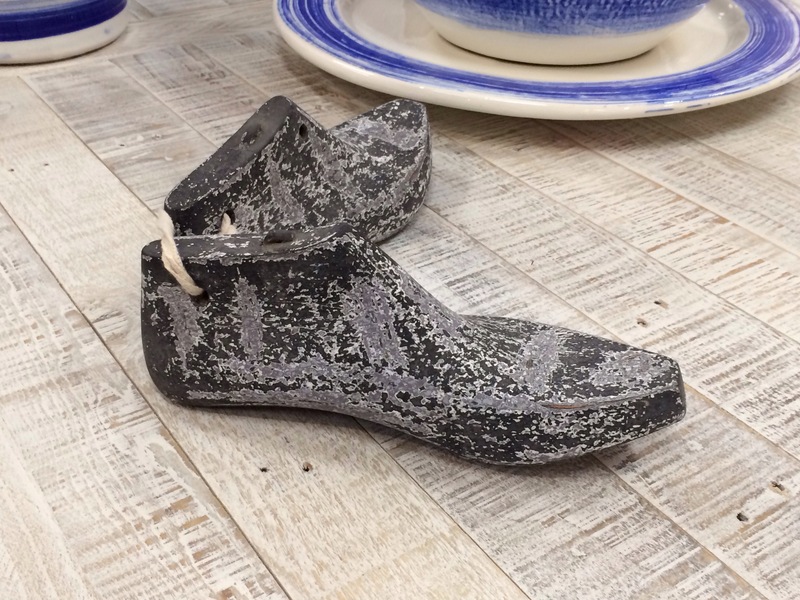 Shoe blocks are just…….just……odd. My sister did gymnastics and as far as I can tell, this is a mini vault for Baby N. I’m sure the designer thinks “ottoman” . I think “vault”. I see “Perth College gymnasium”. I hear “the music my sister did her year 9 floor routine to”. This belongs in a baby gym, not in a lounge room. Sorry Oz Design. So there you have it. I burned 153 calories on my walk and mentally spent $3852. September is our birthday month, with one third of our family’s birthdays falling then. J: Giant Lego Star Wars set which has not been released yet. 5. Minecraft for Wii U, also unreleased. 6. Lollies and more lollies. 7. Never having to do homework again. 8. Getting to stay home from school whenever they want. 10. Baby N to not grow any older and less cute. As I am unlikely to provide 7 – 10, I feel as though they should get 1 or 2 things from their wishlist. If you can’t get what you really REALLY want on your birthday, then there’s not much hope the rest of the year. My problem with their wishlists (which may be of my own creating, but I guarantee you, it’s accurate) is that with the exception of wheely shoes, it’s rather sedentary. And uncreative. Whilst I don’t think their birthdays are necessarily an educational opportunity, I do feel a compulsion to provide a balance of birthday presents, and not just feed the screen-driven beasts I am rearing. 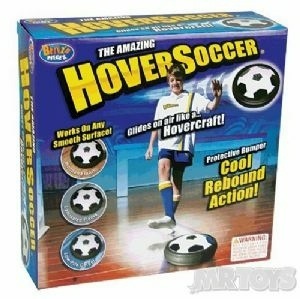 “Shopping Girl’s Guide to birthday presents for boys aged 9-11”. 1. iPod Touch. 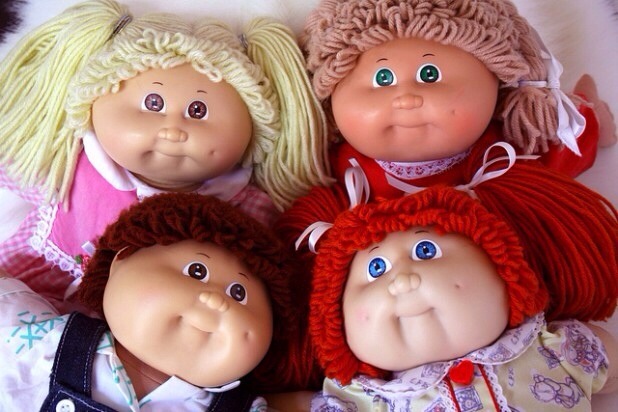 It’s their number one, their Cabbage Patch kid, if you will. The magic of birthdays is kept alive by getting that one thing you really want. And if everyone has a screen then I get what I really want – peace and quiet. My boys would love this. Not as much as they would love an iPod, but it still has the potential to keep them busy. If I tell them to go and play noughts and crosses for an hour they will not so much laugh in my face as whinge in it. However give them a notepad like this where the lines are all neatly and graphic-designer-y laid out for you, and “cool!” they will exclaim. Who knew home drawn parallel and perpendicular lines were so lame? Pinterest ready. Unfortunately the rooms contain the antithesis of Pinterest: live boys. I arrange their toys artistically, instagramatically, upon their shelves…..they play with said toys and if I am LUCKY they put them back….but the shelf now resembles a jumble sale. Baby N does NOT understand that his books are in rainbow colour order. I have decorated their rooms to the best of my financial and artistic ability in the hope that they will love them and treat their possessions respectfully. This is not going entirely to plan. Anyway I love this, and I think firstborn would too. This is not something they will love and keep forever. They will not walk down the aisle with this toy. The marker maker is a summer fling……they’ll think they’re in love for a month or two and then they’ll never look at her again. Intense, passionate. But they’ll alway have the memories. Ah, the memories. My best fling toy was Barbie Charms the World. The kids enjoy being creative, and I enjoy them being creative. According to the experts, the benefits of being creative are endless. Unless it’s creative accounting. Then you might end up in jail. The other day one of the kids was complaining about being bored. I suggested we make a pet rock. Child looked at me like I had grown two heads and both of them were alien. The marker maker is creativity for the child of 2014 (not 1986 where I seem to be stuck). I think this looks like fun. Like turning your back courtyard into a life sized air hockey table. Token “outdoor”, “exercise” present. This is more about me than them. I think it looks great, and sneakily educational. The batteries are a pain though. 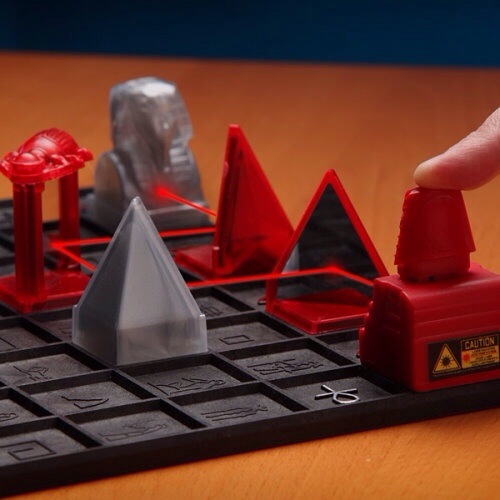 I am all for board games as long as the kids understand they are to play with each other, not with me. My sister never wanted to play Monopoly with me when we were kids. 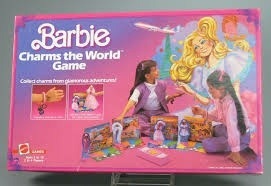 I used to play by myself. I was the thimble AND I was the dog. The thimble always won. Unfortunately for my kids, playing solo monopoly is thus a viable option. I think it builds resilience. Because when you play Monopoly by yourself, you’re always the winner, but unfortunately you’re always a loser, too. First born likes taking electronic things apart to see all the wires and circuit boards. Unfortunately he cannot put them back together. Perhaps this will teach him. 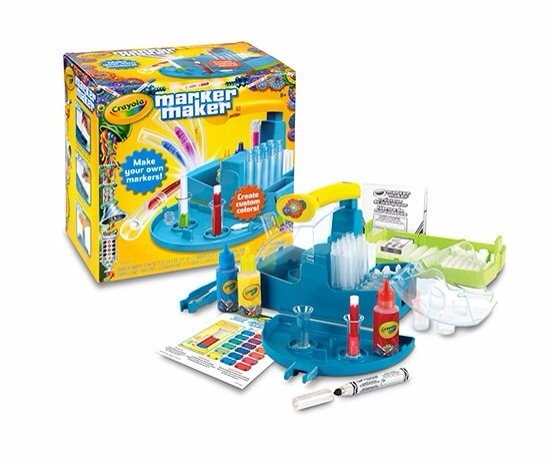 Last year we did chemistry sets. Too much parental supervision required. 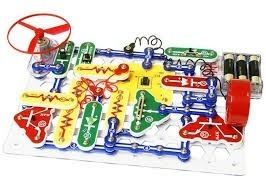 Snap Circuits are this year’s token science present. It’s the next in the series and it comes out in J’s birthday month. Although he has probably slightly outgrown this series now, J’s bound to get excited that the latest is being released. My kids have this strange compulsion to continually want to read new books. When we were kids, my parents bought us new books from time to time. The rest of the time we RE-READ the books we already had. This is a foreign concept to my children, but one which they must learn. 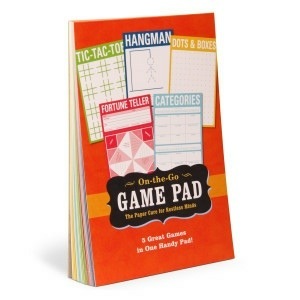 Then they can play one of the best games my sister and I ever invented. The quote game. One of you recites a quote from a book, the other has to say what book it’s from. But you need to be really, REALLY familiar with your home library to do this. So I’ll buy J the new book but really I think he should re-read the first 3 books a few more times, or how else will he ever know the proper response to “She salted her egg, then bit into it”? I have shopping ESP. It’s my secret spy skill, so this is for your eyes only. I can literally sense a sale. It’s a gift, what can I say? I had been waiting for Bonds to do a site-wide discount for weeks. The ever expanding Baby N is starting to give his size 1 Wondersuits a run for their money and I’ve been keen to stock up on some size 2s. No Australian baby should have to live without a Wondersuit. It’s a national right. And considering that Bonds often discounts by 40%, seemingly just for the hell of it, it’s accessible to most. Despite following Bonds on multiple social media sites, I had somehow missed this. Luckily for me, my trusty shopping ESP had not let me down. Those not blessed with a sixth shopping sense will have to rely on regular social media and website stalking. I went onto the Bonds website and ordered some of these….. I ordered 5 altogether. What can I say? You only live twice. I love the terry ones for the colder nights and the thin ones for when it’s not quite warm enough for short sleeves. I love the two way zip for easy changing. I LOVE the attached sock that Baby N can’t dispose of mid-sleep! I love that even though he is toddler sized, he still looks like a baby in his Wondersuits. And I love the cute prints. Even at 11.30pm, when I am half asleep, I can click “Add to Cart”. I really can shop in my sleep. In the morning I had an email order confirmation from Bonds. I also had an unrelated email from Working Boy asking me to please limit any unnecessary credit card expenditure for the next few days as we approached our payment deadline. It scared the living daylights out of me as I cast my mind back to the night before. “Oops!” I emailed Working Boy (yeah he’s not called Working Boy for nothing – he is up and out of the house before any of us wake up most mornings), “I ordered some Wondersuits from Bonds last night. 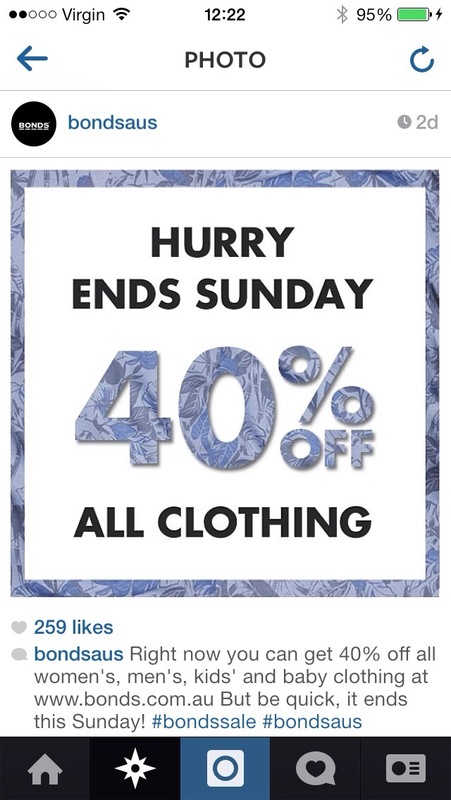 40% off!!!”. A few hours later I received a reply. 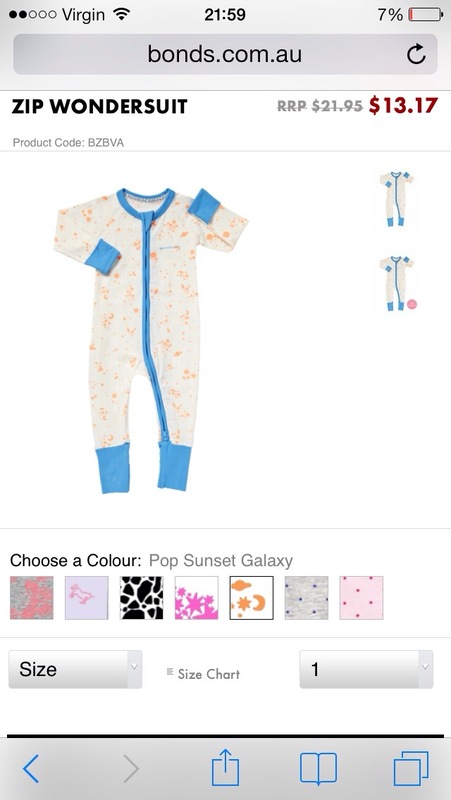 “How can we possibly need more sleepsuits with our fourth child???”. “Live and let die!” I wanted to shout but granted, this was a valid question. One for which I had an answer. So I replied “Because the world is not enough! And also at this age our other babies weren’t as big. By the time they needed a size 2 they wore proper pjs. They weren’t babies any more. 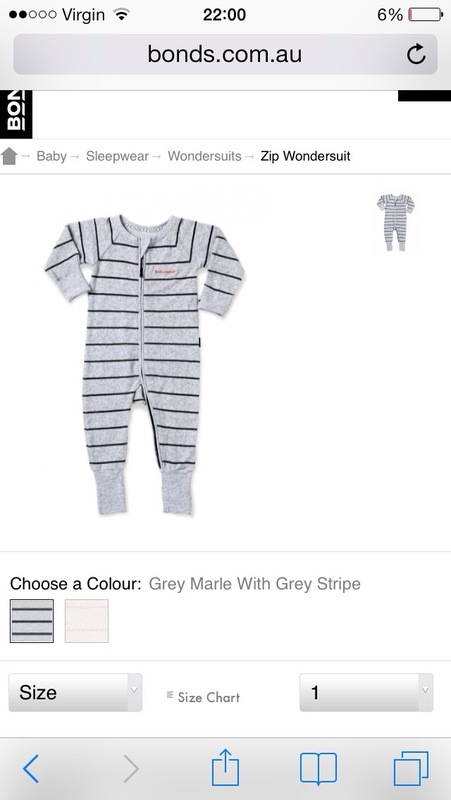 Wondersuits are still the best and easiest sleeping option for him while he’s a baby”. It doesn’t seem to matter how many kids you have – there are always more things you need with a baby. Or things that you don’t necessarily NEED (as in water, food and shelter) but things that will make your life easier. Diamonds are forever but high chairs are not. if it’s because my outings last that much longer with older kids, thus necessitating more supplies. There are many reasons I can think of…..but when push came to shove, suddenly I needed a baby bag again. I chose the So Young. Army green, on-trend and casual. Straps onto pram, freeing up my pram basket for shopping. Insulated food section. I actually thought I would just stick it in the pram loaded with my baby stuff and carry a normal handbag…..but at the moment it’s easier just to chuck my purse and phone in too, and be ready to go, hands free (well in as much as you are hands free pushing a pram and sometimes simultaneously carrying a baby). I actually like that it is clearly utilitarian. Nothing worse than a nappy bag trying to pretend it’s actually stylish. There are a few other things I’ve had to replace this time around too, most notably the baby bath seat. Baby N was simply too big for our previous bath seat. I tried to ignore it, but when Working Boy had to answer the door mid-bath, and Baby N came to the door wearing the bath seat because Working Boy could not get him out, I had to face that we needed a roomier model. It was really, REALLY hard to find a bath seat that Baby N fit in. His thighs were simply too big for 99% of all baby bath seats. One day, my amazing friend DG called me and told me about a bath seat she’d seen that she was sure he would fit into. I don’t think that many people put their babies in the bath seats on the counter of the shop before they buy them but I had to check the safety bar could close over his thighs. Thank you DG and Baby Village. him Doctor No, and the situation, a work in progress. Ps There are 8 Bond movie references hidden in this blog. How many can you find? I have a strange shopping compulsion. I am often propelled to purchase things for the life I think I should be living rather than the life I actually am living. This explains the stilettos I cannot walk in, the significant amount of sequins in my wardrobe, and my fascination with studded fashion. The children call it my armour. “Are you going to wear your armour shoes today to go with your (Alexander Wang Rocco) armour bag?”, they have asked on occasion. The answer is no incidentally. I think the rose gold flat studs on the bag coupled with the silver spikes on the shoes is overkill. But, separately mind you, the studs and spikes make me feel rebellious. They make me feel a little less suburban housewife, even though there are no two ways about it – that is exactly what I am. I have spoken before of trying heavy black eyeliner to feel a bit less “mummy” after a bad night. This is not a great idea because when you are a “mummy” and you’re tired and distracted, you rub your eyes a lot, forgetting your rock-chick liner of the morning. In the same vein, I listen to triple j. (But not when the kids are in the car because swearing. I also don’t listen to most commercial stations because stupidity). Mostly it’s because I like 70% of their music and the announcers are not complete idiots. But it’s also partially for the black eye-liner effect. It is with this framework in mind that I recently bought these earrings. I was feeling a little rebellious yesterday (a morning at home playing with a 13 month old and loading dishes into the dishwasher can have that effect on me) and so I decided it was time to crack open the earrings. Baby N was napping. Everyone else was out. The pressing housework was done. So I went into the bathroom to put them on. I thought I might need the assistance of the mirror for the ear cuff placement. I needed much more than a mirror to get these bloody earrings on. For a start I needed thinner ears. I put the single spike in one hole. No problem. I put the second spike with the chain in the other ear. No problem. I raised the cuff towards the top of my ear and tried to slide it on. Nothing. I tried again. Nothing. I used one hand to rearrange my ear into a more presentable shape and tried again. No game. The space that the ear cuff presented was simply too small for my ear. In seconds I had developed a new complex – clearly I have fat cartilage. A new low for global women’s body image issues. Now I am on a mission. No earring calls me fat and gets away with it. I am not giving up. 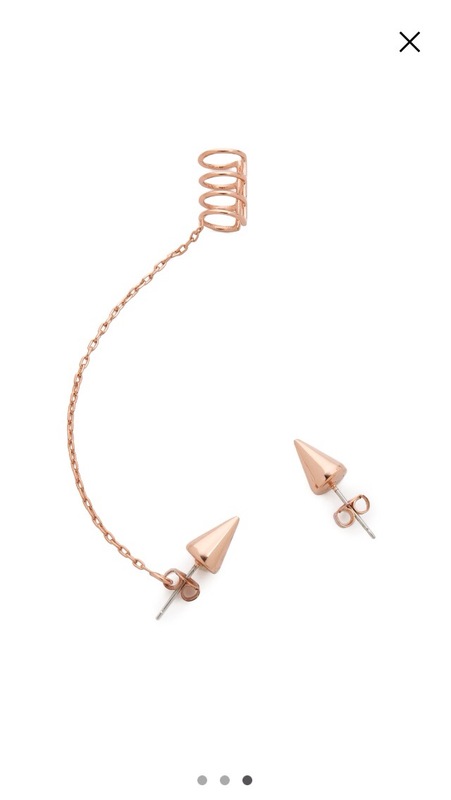 Not only have I spent money on these earrings…..but my ears need the rock n roll lifestyle that the earrings promise . I gently try and prise the cuff open. It moves a millimetre or two. I try again, but the opening is missing my ear. I try and move it closer but the mirror is starting to confuse me and my hand moves even further behind my ear and gets tangled in my hair. Baby N wakes up and starts whinging through the monitor. I may or may not swear. whinging has increased in volume and frequency. There is a reason that I should not be wearing these earrings and it’s not that I am too old and conservative, though both of these is true. I do not have TIME for earrings that take 15 minutes to put on. I admire my (glowing, edgy) ear in the mirror and let go of my hair. You now cannot see my ears. Clearly this has been worth all the effort. Still stubbornly triumphant, I leave the bathroom to tend to Baby N, with the growing sensation of a vice gripping the cartilage of my ear. Comfortable. squeezy hug. As we pull back, she is rubbing her cheek and wincing. I have stabbed her in the face with one of my spikes. Sorry chicken. My studded J Crew jumper is too heavy to wear. My newish Ginger and Smart skirt cannot be worn around Baby N as he pulled off significant chunks of the raffia the first time I wore it. This is problematic as 99.99% of the time, I am with Baby N.
As I said, I have an issue with actually dressing for my life. These earrings are not family friendly. They are not friend-friendly. I went to order a book the other day. 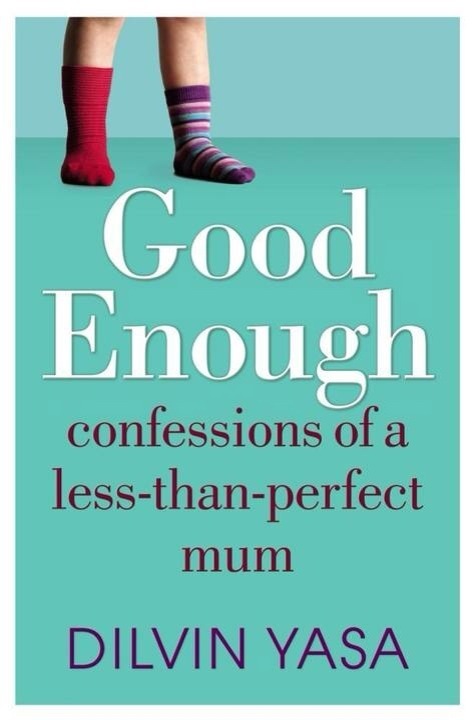 Good Enough: confessions of a less-than-perfect mum” by Dilvin Yasa. It looks like my kind of book. Motherhood: self-deprecating, honest, amusing. I once, only once, bought a book that was the opposite of this. Some sort of guide to yummy-mummy-hood. Singing the virtues of hummus on oat cakes as a good snack to get through those timeless newborn days. The importance of me time. Date nights. Taking care of yourself (gym euphemism) and other such ideas which are so far removed from my experience of motherhood that it’s surprising we can use the same term for the process of looking after a small person we call our own. Unless those oat cakes were laced with Valium/coffee/wine/something illegal. Anyway, Yasa’s book does not look like this at all, and I want to read it. So I went online to order it and then I paused. Because I was experiencing déjà vu and I thought to myself “Have I already bought this and forgotten?”. I know I haven’t read it, and I do want to, but I honestly could not remember if I had perhaps already purchased it and was waiting for it to arrive. Or had I bought it on the kindle app, and then promptly forgotten (because really the only time I read is after dinner on a Friday night, when I don’t use my phone / iPad. It’s a Jewish sabbath thing. But the price of a kindle book is so attractive I seem to often overlook this flaw in my reading system). This is not the first time that I have had shopping amnesia. 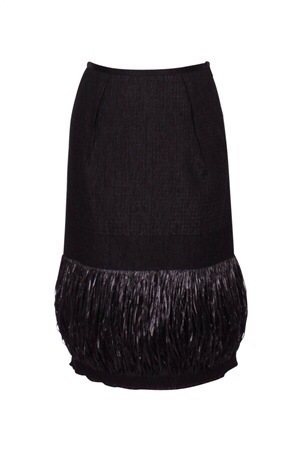 A while ago I spied a stunner of a Bianca Spender dress on sale online. Reduced from five hundred and something to $220. A dress, I find, is a more economical way of shopping. You get more bang for your buck buying one thing that is a complete outfit than you do with separates. I didn’t buy it because I wasn’t supposed to be spending. But as the date of the end of sale loomed closer I convinced myself that it was A Dress Not To Be Missed. On the last day of the sale, I received an email informing me that it was, indeed, the last day of the sale. Nothing like a bit of pressure to convince you to lighten your purse. I opened the Bianca Spender website but then something happened (most likely Baby N’s mother-sitting-down- and-doing -something-for-herself-radar went off and he woke up) and I got distracted. As I got into bed at 11.30pm that night, I remembered the sale was finishing at midnight. I went back to the website, added the dress to cart, but before I could complete the purchase, I fell asleep. Shopping Girl, Interrupted. I woke up at 2.30am (Baby N’s mother-in-deep-sleep radar) with the phone resting on my finger tips. And then I remembered what it was doing there. I checked the website and true to their word, the sale had ended at midnight. I did also go and put Baby N back to sleep. Well. Now I was on a mission. Nothing like missing out on a dress to make you realise that it was a must-have. I went to David Jones the next day to find it. I knew it would still be on sale there. There it was, but in miniature. I asked the sales assistant for my size, and she helpfully told me that rather than transfer from another branch, they would post it directly to me. I think she was happy to avoid a second encounter with Baby N who was vocalising his displeasure at the sedentary pram. as I fell into my heavy slumber? Or had I been sleep shopping? Was I now the owner of two stunning Bianca Spender dresses? This shopping amnesia all comes about from online window shopping I guess. It’s a bit like browsing, even trying on a bunch of things, and then walking out the store. Sometimes I shop online, fill up my cart, but once I take a look at that total, sometimes seconds away from clicking confirm, I instead close the window. It still feels a bit like shopping. I know I’m not the only one who does this. Or sometimes I just leave the safari window open to remind myself that when the credit card clicks over to the next month, and we’re not so close to maxing out, I really should but that dress / book / electric guitar. This behaviour makes it very difficult to remember sometimes if I’ve actually bought something and I’m still waiting for it to arrive or whether I’m still waiting to buy it. I end up searching my inbox, and then my email trash, for purchase confirmations, which 99% of the time do not exist. Once Shopping Amnesia is recognised as a legitimate medical condition it will provide the perfect response to that age old suspicious question, “Is that new??”. “Yes, honey, I guess it is. I just found it hanging in my wardrobe. I remember seeing it in the shop, but everything after that is a blank”. And fortunately there’s no pill for amnesia.